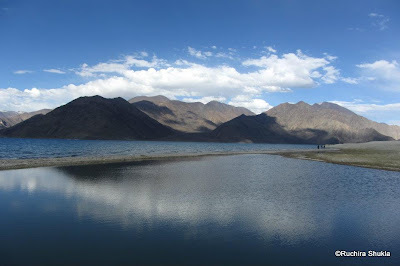 Lets go back to Ladakh today, to Pangong lake, that is more famously known as the lake where the movie three idiots was shot. The lake is mesmerizing and its beauty simply takes your breath away. I really have no words to describe it. So I will just leave you with a few pictures. Frankly I don't think they do justice to the beauty of the lake but I have tried ! The Lake is supposed to change color almost every hour depending on how the rays of the sun fall on it. Can you see the different shades of Blue and green in these pics ! 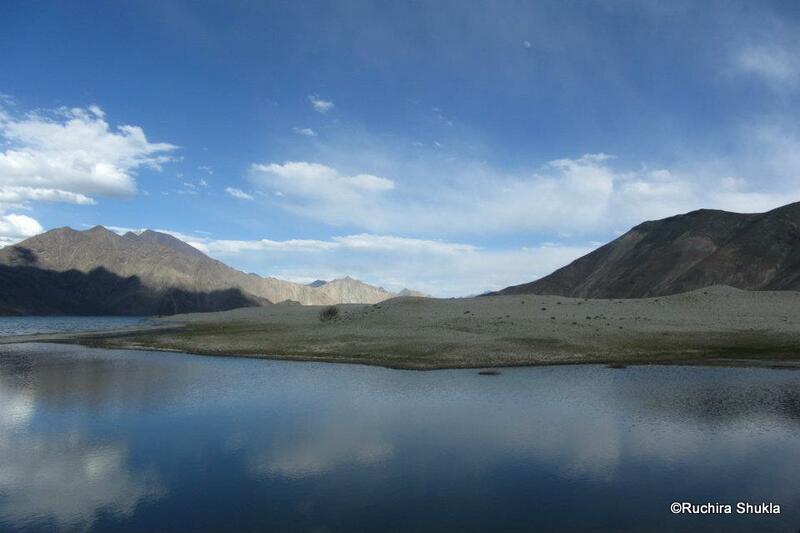 I also loved the play of shadow and reflections caused by the sun. A single cloud in an untarnished bright blue sky ! I liked the way the sun lit up these mountains ! 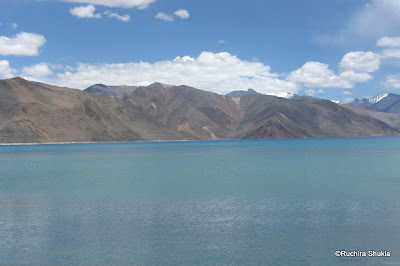 Pangong Lake is huge, only 25% of it is in India and the rest is in China. we walked along the lake for over 2 hours, mostly in silence, lost for words and totally in awe of the incomparable beauty around us. 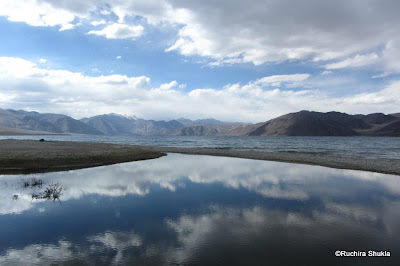 Pangong is a remote area.The only way to communicate with the outside world is through a satellite phone at the army camp nearby. Not many people want to spend the night there, But we did and it turned out to be one unforgettable night! We were far far away from humanity and we could almost hear the silence. At night the stars seemed so bright and so close to us that we felt we could almost touch them. 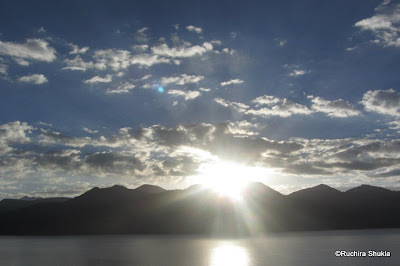 In the morning we were rewarded with one of the most glorious sunrises I have ever seen ! I'm just dropping by with A-Z. Beautiful photos! I'm Canadian - loved your Canada Chronicles. If heaven is on earth this must be it :)!! I have seen whole Ladakh thru ur posts . Now only thing left is to visit the place !! Spectacular and the sunset looks awesome. Thanks for sharing. It looks like a large, sheer mirror! I can well imagine that the pictures may not do it justice! Did you camp out there? 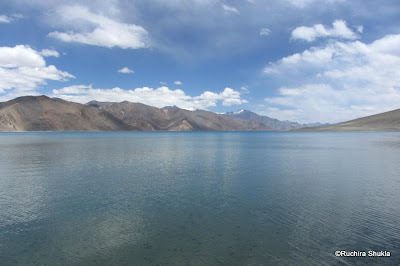 I saw this lake in the movie, THree Idiots, but I had no idea that it was called Pangong. The cinematographer of the film did complete justice to its beauty. And you have done likewise. I liked the fact that you walked by the lake in silence. Oh the sheer beauty of it! No words. Such a terrific photographer you are. Loved all the pictures. Amazing, spending a night so close to nature. Beautiful shots. 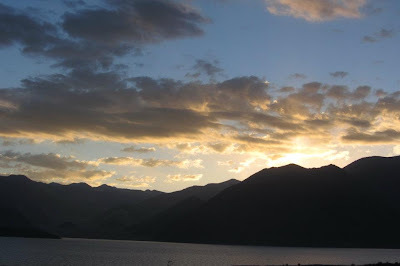 Oh those skies...No words to describe the beauty of Nature! Hello, Ruchira! How lucky you are! Not everyone will get the chance to experience this beautiful lake. Thanks for sharing your gorgeous pictures! Just Wow! 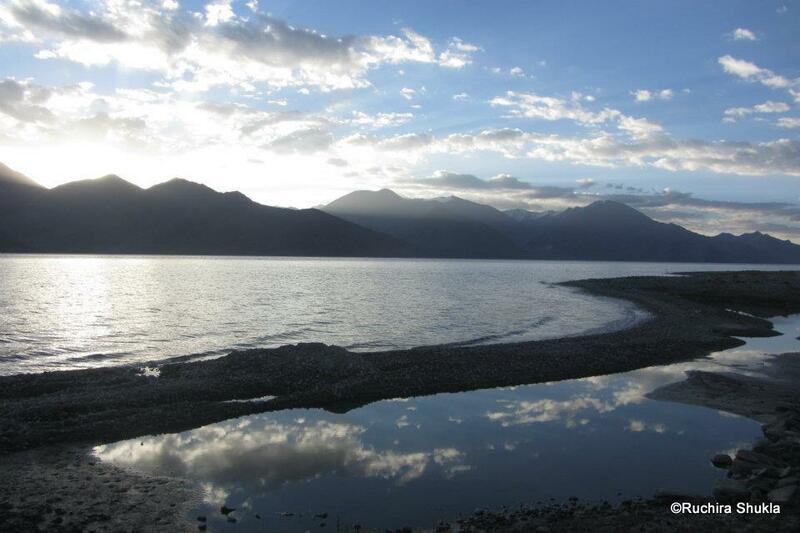 Is it the same lake that adores your header too? And spending a night in such a place sounds nothing less divine to me! Must be the best-est of the nights ever! One day I will go there. yup ! One Day I will surely go there ! 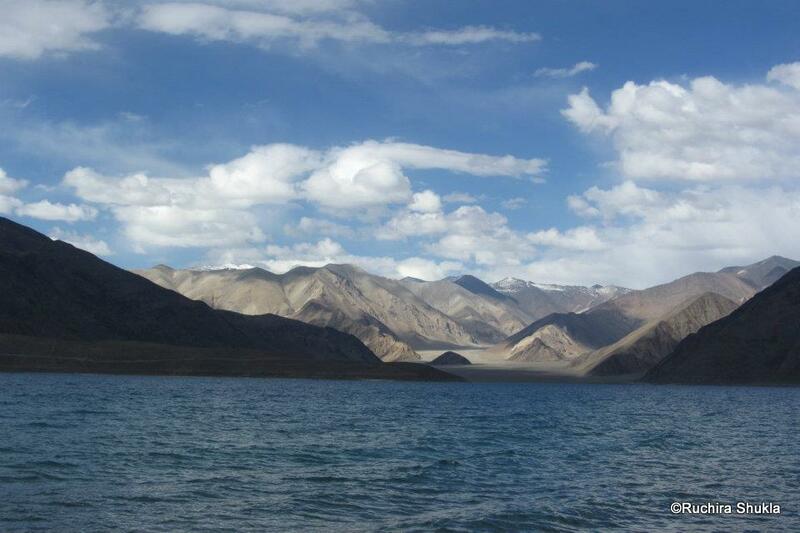 I was at Leh for cycling and did Photula and till south Pullu by Cycle. 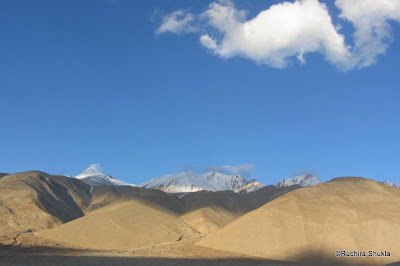 Planning Khardungla next time and Also Nubra and Pangong Tso in tents. :) Beautiful is an understatement for this place. Its just heavens.